There’s no way around it: utter the phrase ‘yum cha’ in Brisbane and one of the guaranteed responses will be ‘Sunnybank’. The south side ‘burb is known as the city’s assembly point for authentic Asian tastes, with crowds flocking to Sunnybank streets for ramen, sushi, and Korean BBQ on the daily. But this foodie wonder is far more than a one-trick pony. Sitting just next to Mt Gravatt’s Garden City shopping centre (and just so darn perf for those post-shopping cravings), it’s time to look on the Sunnybank side: these gems can’t be missed. You’ll feel like royalty when you’re sipping a cup of the high-quality brew from MajesTea, whether it be a fresh fruit tea or one of their special-teas with cheese. Think cheese lychee oolong, cheese watermelon green tea and cheese black grape – and even three different flavours of cream cheese topping to choose: original, sea salt and black sugar. Don’t confuse the lack of options here for lack of taste – all you need to order is the large fried chicken, in either original or crispy, with a side of curly fries and you’ll know why everyone keeps coming back to this takeaway spot. Searching for a little bit of Singapore with some big flavours to match? Wok this way for Malaysian food icons like saucy satay skewers and spicy laksa. This Market Square restaurant dishes out stir fries cheaper than a fast food meal and freshly-squeezed juices that always bring a line to the counter. 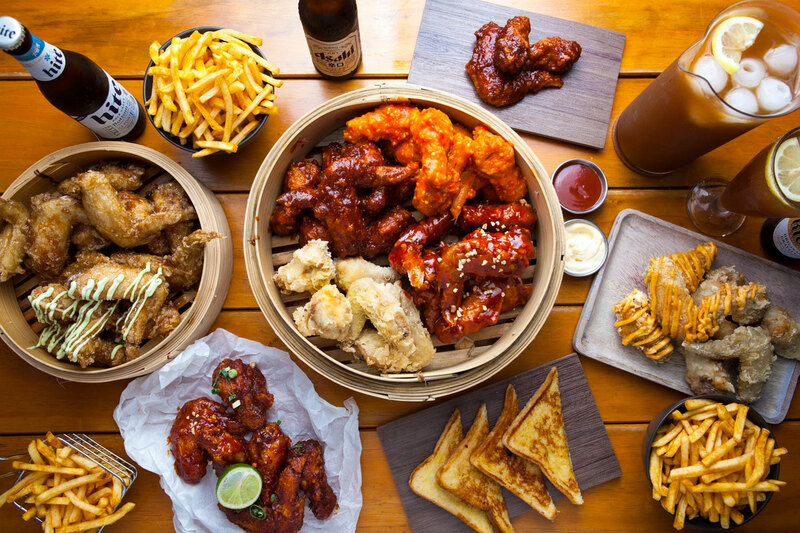 They say ‘all you can eat,’ we say ‘you’ll regret that in half an hour.’ We’re always up for a challenge, and Seoul Bistro’s wing buffet is exactly that. The small bistro spot fries up chicken worth shaking your tail feathers for, with seven flavours to try in your free-for-all night of all-inclusive wings, chips, and homemade iced tea. OK, sure, it’s a little embarrassing for our friends when we whisper sweet nothings to a bowl of noodles, but we just can’t ramen calm when dining at Ramen Champion. Saving uni students and workers who can’t be broth-ered cooking, the Sunny Park joint ladles out six ramen picks, but if you really want to challenge yourself, give the giant ramen challenge a try. Sunnybank’s personal flavour shines through in this all-day spot. While you’ll find plenty of café norms (smoked salmon and poached eggs, for instance) on the menu, Southside Bistro plates up a few left-field creations: and we don’t recommend missing out on the ramen burger or sizzling chocolate brownie. The CBD burger spot migrated south for our cravings, and don’t be fooled – one container can hold a whole lotta burger love. With a menu resembling a set of IKEA instructions (except instead of an infuriating Swedish bookcase, you get a burger), you become the burger engineer – meat, bun, cheese and all. Remember: there are no wrong answers, just more trial burgers. It might not be as well known as some, but if you’re keen for a yum cha feast, Taste Gallery is the spot to do it at. Sit down and await the food coma with basket after basket of steamed pork buns, deep fried crispy duck and a whole lot of dumplings. Feel like those plastic tubs of honey chicken aren’t quite offering the authentic Chinese dining experience? You’ll find the cream of the Suncrop here, with fresh king prawns deep fried ‘til crispy, and their signature mud crab with ginger and shallots. It’s not often we miss our morning latte (in fact, we’re pretty sure HR has a rule against it), but for Sonder, we’d swap it for matcha tea any day. The Japanese tea house rolls out desserts that will have you captioning every Insta shot kawaii – from the black sesame ice cream to the rose and lychee cheesecake. Yeaaaah, you’re gonna want to drop the tomato sauce – this isn’t your average ‘snag on a barbie’ situation. It doesn’t get fresher than becoming the chef of your own table at Sunny Seoul’s Korean BBQ. The staff heave platters of marinated meats and sides to your table for you to load onto the hot plate. Repeat as needed (or, in our case, until pants no longer comfortably fit). Ask yourself: does it really matter if you can pronounce a restaurant’s name if your face is stuffed with pho anyway? Order slurp-worthy serves or beef or chicken noodle soup and prepare for a session of awkward chopstick fumbling. Yep, you’ll need napkins pho sho’. Suddenly, having dinner plans go south doesn’t seem like a bad thing. - The gourmand who uses any excuse to get down to Sunnybank.